Comfortably atop their group with three wins, the American women are preparing to face New Zealand in the quarterfinals of the 2012 Olympics’ women’s soccer competition. Finishing in third place of their group, New Zealand was 1-2 in the opening stage and will have to come up with a Herculean effort to challenge the Americans in the quarterfinals on Friday, August 3. The Americans will be happy with the results of the first round, having established themselves as the top team of the tournament. Though they’ve started slow at times, the US women have outscored opponents 8-0 after the first 15 minutes of games. Abby Wambach and Alex Morgan have formed a formidable two-pronged attack with five goals between them, and Morgan’s ability to find Wambach in the box led to the only goal of the game against North Korea. 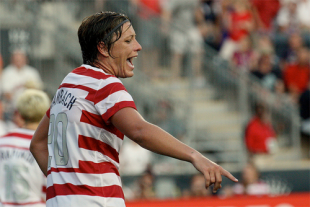 Morgan’s goals in the game against the French directly resulted from Wambach’s ability to use her body to disrupt the defense. These two will continue to work well together and create scoring opportunities for one another as the tournament progresses. Another bright spot for the Americans was the play of midfielder Megan Rapinoe. Rapinoe was like the energizer bunny in the first two games. She seemed to be all over the field, wreaking havoc on the defense. Her efforts paid off as she set up three of the goals against the French, and scored one of her own in the game against Colombia. And while she gave possession away against North Korea much too easily, she will look to regain her form in the quarterfinals. The biggest surprise for the Americans has to be the play of Carli Lloyd. Lloyd lost her starting spot to the younger Lauren Cheney but was called on to replace the injured Shannon Boxx early in the first game. She responded by scoring a goal in each of the first two matches and has provided a calming presence in the defensive midfield position. Lloyd still has a tendency to hold the ball too long, but she is showing her maturity with her improved decision-making. The biggest question for this US team remains their ability to defend. While it’s true that the US has a shutout streak of over 220 minutes, they were largely untested in their final two games of the qualifying round. The defensive line made numerous mental errors, leading to the two goals in the first game against France and they continued to look shaky against a weak Colombia side. Hope Solo may disagree, but for the US to continue their gold medal run, the defensive pairing of Rampone and Buehler will need to communicate more effectively. As the US now faces tougher opponents, the defense will need to stay organized to minimize chances for the opponent. Additionally, they must be more effective at keeping possession in their own half of the field. The US also needs to be more efficient offensively. Yes, they scored eight unanswered goals in three games, but there were more opportunities for the taking. The 1-0 win against North Korea could have been lopsided, as two shots hit the post and Tobin Heath smacked a great opportunity over the crossbar in the second half. The US needs to start taking advantage of quality opportunities, as they will see fewer of them against better teams. This game is a rematch of the third place game of last summer’s World Cup, and it should have the same result. Sweden is a strong offensive team, and have numerous weapons. They also have an experienced midfield that can control the flow of the game. France is an improved team from last summer, and have the ability to score in bunches. Most of their goals, however, came against weaker teams, and they struggle to stay composed in the midfield. New Zealand is a team that has continued to improve since the World Cup last summer. They lost to Brazil and Great Britain by 1-0 scores and defeated Cameroon 3-1. They were seven minutes away from a scoreless draw in their game against Brazil before bending too much under intense pressure. They were clearly playing for the draw and frustrating Brazil with their defensive pressure. It will be no surprise to see a similar approach in the quarterfinal match against the United States. New Zealand will play defensively and hope to get a goal off of a counter attack or a set piece. The US will need to stay composed in the midfield to limit turnovers, and they will need strong games from the pairing of Wambach (who has scored in each match so far) and Morgan. This will be an exciting game between the reigning World Cup champs and the electric Brazilians. Neither team looked as sharp as expected in the qualifying round. Brazil struggled to find the net in their final two matches, failing to score against Great Britain, and frustrated until the 82nd minute by a pesky New Zealand team. Though they generated a number of chances, the talented front line was only able to finish one of them. Likewise, Japan only scored in their opening game against Canada. They played two scoreless draws with Sweden and South Africa and have not looked nearly as strong in possession as they did last summer. In the other quarterfinal in the United States’ half of the draw, host Great Britain takes on Canada. Great Britain was expected to move on to the quarterfinals, but they were not expected to win their group, or do it without conceding a goal. They were the only other team (along with the US) to win all three group stage games, including a 1-0 upset of Brazil. The Brits are playing with confidence, and should continue their run at an Olympic medal. Canada saved their best game for their final group stage match against Sweden. They went down 2-0 before coming back to pull off a draw behind two goals from Melissa Trancredi. The Canadians have had some injuries to their back line, and were disorganized throughout the qualifying round. Great Britain should be able to take advantage of a few mistakes as they advance to the next round.